By Catholics: Did you know that pretzels are a Lenten food? 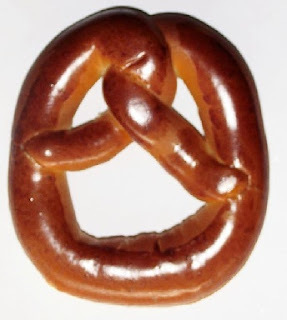 Did you know that pretzels are a Lenten food? Mix 1 pkg. active dry yeast with 1 Tbs. sugar in 1 1/2 cups lukewarm (100-110 degree) water. Mixture should bubble. Stir in 1 tsp. salt and 4 cups flour. Place on floured board and knead in 1/2 cup more flour. Knead about 8 minutes. Divide into peices, roll into ropes, and shape into pretzels. (As you fold the "little arms" pray the Lord"s Prayer or another Lenten prayer.) Let rise until about double in size.